The pretty town of Akranes offers a beach, a beautiful forest and a fascinating museum, as well as being home to the nation´s best football team. After the construction of the Hvalfjarðargöng tunnel in 1998, the west of Iceland has become easily accessible. You can now skip the lengthy drive around the never-ending fjord of Hvalfjödur and enjoy the beautiful sights that west Iceland has to offer, in less than an hour. The town of Akranes lies just across the blue straits and is visible from Reykjavík on a clear day. Settled by Irish brothers in the year 880, it is now a blossoming industrial town with a focus on fishing and fish production. An area worth visiting is the seafront, especially the beautiful sandy beach, Langisandur, stretched below the center of town. This is a popular spot for sunbathing and picnics in summer, and children love paddling in the clear water looking for crabs and seashells. For a warmer swim, try the fabulous nearby geothermal pool, Jadarsbakkalaug, where you can soak after a long day at the beach. In the Gardar area of Akranes, you´ll find a cluster of interesting museums. The new folk museum at Gardar hosts a large, complete collection of objects showing the industrial development and culture of times past. The objects date from the time of settelment until the last century, and among them you can see old vehicles, a dentist´s chair, printing machines, national costumes and even fishing boats. Surrounding the museum are a number of old houses which have been refurbished in their original style and make for a fascinating trip back in time. Next door, the new 630 square metre museum center houses three different museums. The first is a collection of Icelandic rocks and minerals, including an exhibition on the construction of the Hvalfjördur tunnel. The second is the Museum of the Icelandic Geodetic Society , and the third is the Akranes Museum of Sports, which will give visitors an insight into Akranes´great footballing past. Akrafjall mountain on one hand and the greenery of the forest on the other. Akranes traces its history all the way back to the Period of Settlement, when around the year 880 people of Irish descent settled in the area. The name Akranes indicates that in the old days corn was grown in the fertile land around Mt Akrafjall which towers in the background of the town. Around the middle of the 17th century Bishop Brynjólfur Sveinsson of the Skálholt bishopric in South-Iceland had some of his fishing vessels stationed in Akranes, thus bringing about the birth of the first fishing village in Iceland. His purpose was to obtain some income for the running of the educational establishment at Skálholt. Since that time fishing and fish processing have been important means of livelihood in Akranes. In 1864 Akranes was granted the right to be a trading place. The shopkeepers served the fishing village itself as well as the adjacent farming community at a time when communications with Reykjavík, the capital, were mostly conducted by sea. In 1942 the village of Akranes was granted its municipal rights, marking the beginning of an era of growth for the villagers. Around 1960 a great part of the fishing fleet was renewed and Fishing and fish processing was strengthened considerably. With the founding of the cement factory in 1958 still another base was laid for the people of Akranes to earn their living and soon the local authorities began laying the streets of the town with a permanent surface thus being among the first townships in Iceland to do so. Another landmark in the history of job opportunities and employment for the inhabitants came in the late 1970s when the ferro-silicon plant Icelandic Alloys at Grundartangi in the neighbourhood of Akranes began its operation. Here we have a power intensive industry needing much electricity in the form of hydro-power. Today 5200 people live in Akranes and the future is bright with predictions of a population increase in our town, unlike other areas in Iceland outside the Reykjavík area. In Akranes there are examples of almost all architectural styles to be seen in Iceland and in one street, Vesturgata, one can see houses dating from the beginning of this century to the present day. The first house in Iceland to be built of concrete poured into special moulds during the building pro-cess is to be seen at Garðar on the outskirts of town. It was originally built as a parsonage in 1882. Today this house is a part of the local folk museum. In 1896 the use of the local church at Garðar was abandoned and a new church was built closer to the centre of town at that time - where it is still standing. What characterizes present day Akranes is its vibrant working life, its lively participation in all kinds of sport and the pleasant and happy existence of people close to the capital, Reykjavík. Akranes unlike other communities outside the capital has a broad economic base and this prepares the community for potential fluctuations in the economic field which in a way characterize Icelandic economic life. Akranes has always been a significant fishing town with important fish-processing firms, one of which, Haraldur Böðvarsson Ltd, was founded in 1906. It is still among the most important companies in the country with factories both in Akranes and in Sandgerði on the very southwest coast. There are other firms in the fish business in Akranes and their employees have much experience and knowledge in this field. A shipyard in Akranes, Þorgeir and Ellert, originally founded in 1928, mainly serves the fishing industries with ship maintenance and making equipment for fish processing. They also serve the Cement Factory Ltd, Icelandic Alloys at Grundartangi which produces ferro-silicon for export and Nordural aluminiumplant which is owned by the American company Columbia Ventures. Most of the employees at Grundartangi (70%) come from Akranes. Other small industries are also operated in Akranes. There are relatively many shops in Akranes and have always been important in the town´s life. Not only did the shopkeepers serve the people of Akranes but also the neighbouring areas, as communications with Reykjavík weren´t always easy. Nevertheless there was competition with the shopkeepers in Reykjavík and in Borgarnes for the favour of the consumers. Customers, wherever they come from, do appreciate the inviting atmosphere of our many shops and businesses. Akranes is the largest community in the west of Iceland and most of the country´s largest firms in the service sector have their agents and branches there, such as banks, insurance firms, oil companies and travel agencies. Many other service firms are located in Akranes, serving both Akranes and the other areas to the south of the Skarðsheiði mountain range. Cultural life in each area is very much influenced by the local ways of earning a living and life in general. Most people who visit Akranes go to the Folk Museum at Garðar on the outskirts of the town. Here they can see various artifacts associated with earlier life in the area, things that a number of people still remember from their everyday life and which are now no longer used. At Garðar one can also see unique examples from Icelandic fishing history, ships and boats made in Iceland and abroad as well as fishing and whale hunting gear of interest to both Icelanders and foreign visitors. Garðar, which features in the history of Icelandic settlement, was a church site until 1896 when a new church was built in the village itself. The Cinema Hall in Akranes was built in 1942 by Haraldur Böðvarsson, the founder of the company bearing his name and all proceeds from its operation were given to the local hospital and other charities. The Cinema Hall has also been the venue of theatre performances, meetings and conferences of many kinds. Music and other performing arts as well as painting and exhibitions are important features in the town life. An art gallery is run in a former parsonage in Akranes and an amateur theatre company stages performances every year as does the drama club of the local comprehensive school. There is a music school in Akranes and numerous recitals and concerts are given every year by individuals, local choirs and music groups. Some nationally well-known artists have come from Akranes and in recent years several artists have decided to settle down in town. There is a comprehensive school in Akranes run by the communities in the West of Iceland with pupils from Akranes and the west as well as from other parts of Iceland. Akranes also has two basic schools and four pre-schools. The people of Akranes are possibly best known today for their success in various sports such as swimming, athletics, golf, basketball and soccer. The players of the Akranes Football Team have become national champions in soccer 17 times which is far more often than any team outside Reykjavík has. The team has also won the Icelandic FA cup 7 times. Sports facilities in Akranes are very good indeed, with two relatively new sports halls, two swimming pools and lots of soccer fields in addition to the main football stadium. Akranes has its own Chief County Magistrate and police force and a 9 - member town council. The Akranes Hospital has several medical divisions with specialists in many fields of medicine. 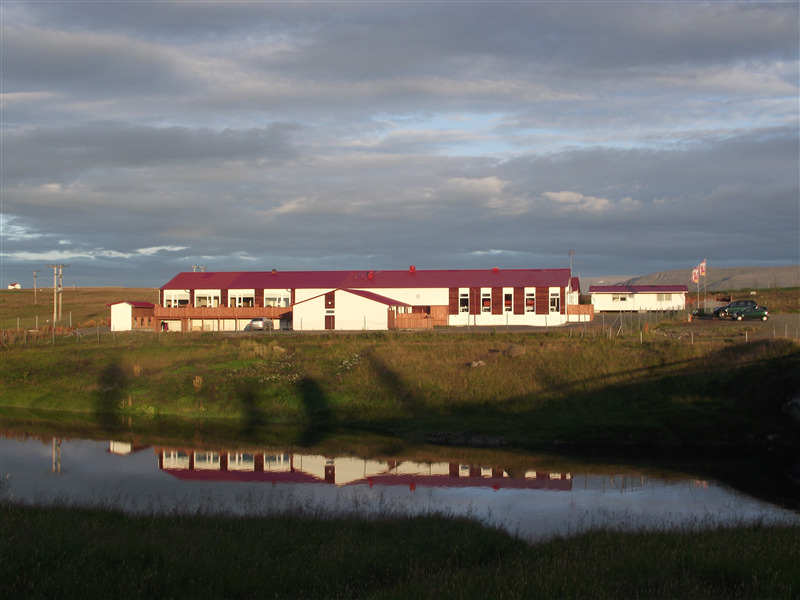 It is one of the best equipped hospitals outside Reykjavík. The Akranes Harbour has always been very im-portant for the town and serves both fishing boats, trawlers and cargoships. Home at Höfði in Akranes. When you visit Akranes you´ll think your time well spent here. You can, for instance, visit the old lighthouse where there is a beautiful panoramic view, the folk museum, the museum of Icelandic stones (The Kingdom of stones), the Hvalfjörður bay tunnel museum, and the local "Long Beach". You may also want to visit the wooded area close to the folk museum to enjoy the peace and quiet there, so far away from the everyday din of a bustling town and yet so close. Close to the folk museum is the local golf club which soon will be able to offer its members and guests a full-fledged 18-hole golf course. 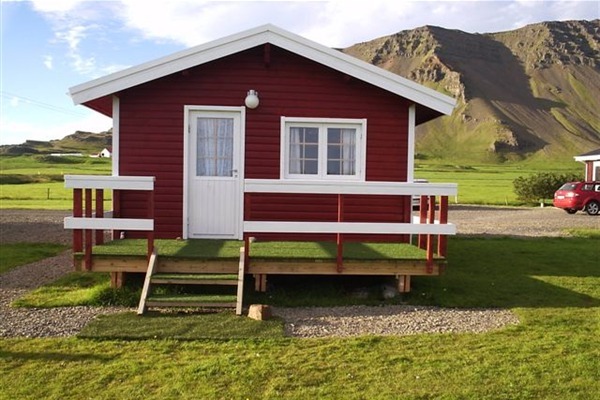 Akranes is an excellent choice for staying in if you want to go on excursions to other parts of the west of Iceland, to the Reykjanes Peninsula or to the south of Iceland. 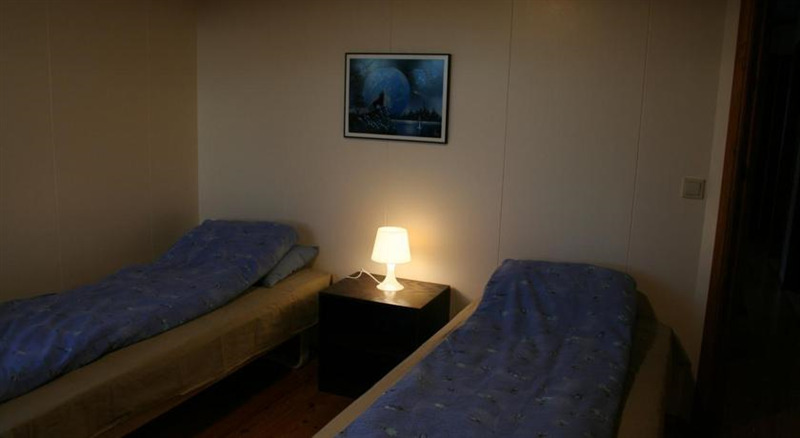 We have a good all-year-round hotel as well as a summer hotel, restaurants, shops and other services that will make your stay in Akranes a pleasant one. In June 1998 a subsea tunnel under the "Fjord of Whales" was officially opened, shortening the distance between Reykjavík and Akranes to about 47 km. (30 miles). This tunnel opened great opportunities for the people of Akranes and the West of Iceland.